Though people say the global economy is drawing a down turn, demand for luxury goods seems to keep increasing. According to a survey, the sales of luxury goods increased in all major department stores last year, an 8% growth on previous year. It is notable that the price of luxury goods in Korea is relatively higher than other countries in the world as the demand is greater. Interesting still, used luxury goods overseas are valued as good as newly released but it is a different story in Korea. Good news is that more people started to recognize its value. The good thing about used luxury goods is that consumers can get hold of one at a good price with its value intact. 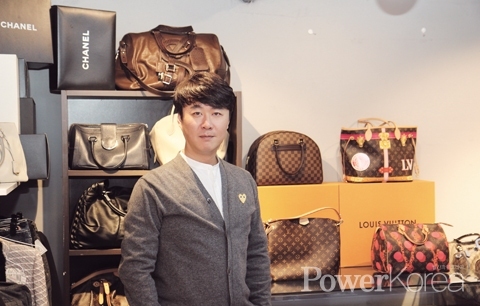 Cha Tae-ho, CEO of Brand-Nara, went to Japan and came to know about used luxury goods by chance 8 years ago. Charmed by it, Cha launched a research and worked as an appraiser and an agent in the used luxury goods market in Japan for 8 years. Korea is the 4th largest luxury goods market in the world after the US, China and Japan. Seeing the possibility of the market, Cha gathered his knowledge and experience in Japan and opened a luxury goods store Brand-Nara in Apgujeong-dong, Seoul, in 2017, when back in Korea. Within a year of opening the store, Cha exported US$1 million goods to the US and Japan. From bags and watches to clothes, shoes and jewelry, you can find almost all used luxury goods at Brand-Nara. You can either pay a visit to the store or can have a chat with a specialist staff on Kakao Talk or Line for appraisal, price and charges. Brand-Nara is the Korean branch of DAIYA, the largest Japanese luxury goods auctioneer. Ota Daiya, CEO of DAIYA, is famous for introducing recycled luxury goods in Japan, the campaign which Brand-Nar is following suit. Used luxury goods at Brand-Nara are guaranteed through double appraisals in both Korea and Japan if the price is dear and the appraisal comes with a QR code to track down the product wherever it is in the world.